L’Oreal Elvive Full Restore 5, also known to some as ‘the Cheryl Cole shampoo’ is the latest launch from the L’Oreal Elvive brand. A few weeks ago I did a review of the Elvive highlights shampoo. The review was less than favourable as I really didn’t like the shampoo or conditioner (and have since thrown it out) so it may be a little surprising that I decided to return to trying the brand out again so soon after a not-great experience. I guess that’s what they call the ‘Cheryl Cole’ effect. Yes, I know – she has extensions and there is no shampoo in the world that will make me look like her – but I can still hope to get a little step closer, right? So I dived back into the clutches of ‘Elvive‘ and tried again. 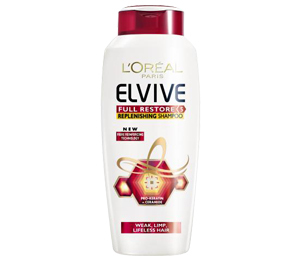 L’Oreal Elvive Full Restore 5 promises to leave weak, limp, lifeless hair looking replenished, with fullness restored. I have pretty ‘blah’ hair, so these promises were really appealing. The first thing I noticed with this shampoo/conditioner is the smell – where I was really put off by the smell of the last Elvive one I tried, this is the total opposite. This one smells yummy, fresh generally lovely. It doesn’t smell of flowers or fruit, somehow it’s a bit ‘powdery’ fresh, like baby talc? Not a great description… but the it’s the closest comparison I can think of. One of the best things that I found with using both the shampoo and the conditioner is how they rinses out so easily, leaving it squeaky clean. This means that hair is really clean and shiny and not weighed down with product… hence less lifeless, so big thumbs up on this one. I’ve been using the shampoo and conditioner for about a month and really think it feels softer, sleeker and less ‘blah’ than before. The boyfriend has also taken to stealing this shampoo, so it obviously gets his vote too – as he usually sticks to a Keratese one. Another plus, it doesn’t irritate my sensitive scalp. Fantabulous. I bought this product with my own money, it was NOT sent to me for review purposes. Next Post New York, New York! So good that if you name a beauty product after it then I want it….